It would seem that Jesus had returned from withrawing Himself, and once again the Pharisees were observing His activities. Someone brought a man who was possessed of a demon, and he was both blind and mute. What a perfect picture of national Israel at this point. There were many among the people who believed Jesus was Who He said He was, but the religious establishment would not accept Him. Once again, Jesus showed His Messianic power. He cast out the demon. Have you ever wondered what this must have looked like? I found some really grotesque pictures of this. One had a hideous demon coming out of the man’s mouth. Another shows him completely surrounded by dark angels who are all snarling and gnashing their teeth. I don’t think it was like that, at least not to the human watchers. I believe they just saw this man, troubled by a demon, suddenly calm and able to see and to speak. Again, I imagine a solemn, quiet sense of awe as Jesus performed this miracle. I don’t think anyone whistled or clapped or jumped up and down claiming high-fives from the others. To be in the presence of the Holy One is a solemn and awesome (in the truest sense of that misused word!) event. The people who were there, I am sure, never forgot what they had seen. “Is not this the Son of David?” Notice that they did not say, “This IS the Son of David!” The way the question was stated implies some shade of doubt. And what did they mean, anyway? 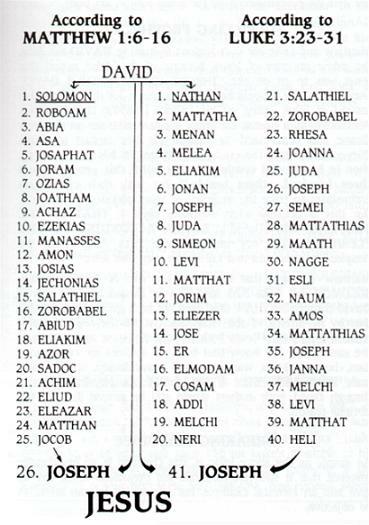 It’s a fascinating study to follow this lineage, which gives Jesus both the royal right and the legal right to claim His place as Messiah. I’m sure there were Pharisees who knew full well what Jesus’ heritage was, and yet they refused to accept Him because He did not come as they hoped and expected He would. As Jesus healed and taught the crowds, He told them not to spread word about Him. This was to fulfill Isaiah 42: 1-4, a prophecy of the life and ministry of Jesus. To journey through these verses is truly an amazing thing. My Servant. . .My Beloved: This passage must have been a great comfort to Jesus, as His own people turned away from Him and accused Him. He knew He was the only Son of the Father, chosen to do a work that no one else could do. I will put My Spirit upon Him: The spirit of the Father rested upon the Son. It was what gave Him strength, confidence, and utter peace. With the Father’s approval, all was well. Judgment to the Gentiles: Some other translations state this as He will proclaim justice to the nations. I believe the meaning is clear that salvation will be offered to all, Jew and Gentile alike. His mission would be successful. He shall not strive nor cry: Jesus would not be a rebel, an anarchist, a rabblerouser. He had no need to fight. He was God’s Son, and He had all power. He was not there to create civil war or an uprising against Rome. Bruised reed. . .smoking flax: The gentleness of Jesus is so profound. He could have come as a might warrior (and one day He will!) but that was not His mission for that time. He was so gentle that He even a bruised reed of grass would not be harmed by His hand; even smoking flax would not be quenched by His power. 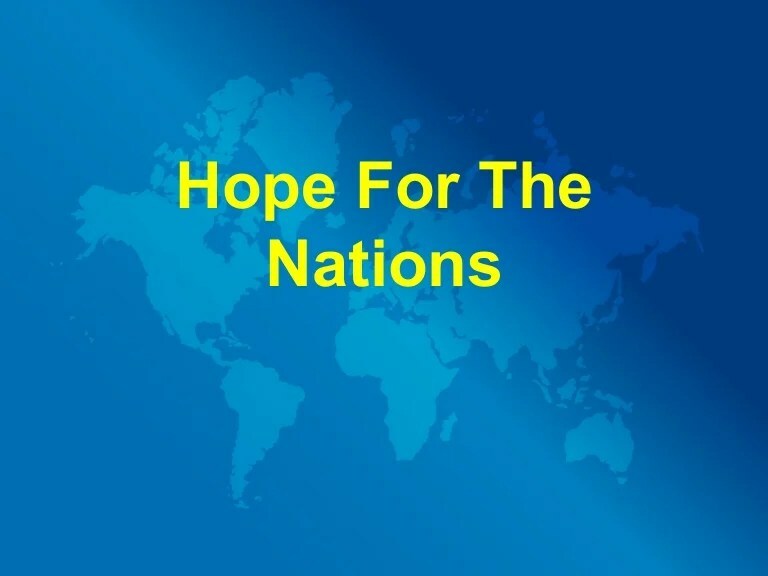 In His Name shall the Gentiles trust: Jesus is the hope of all the world. The prophecy will be fulfilled completely at the Second Coming, but in this passage the Holy Spirit uses it in a different way. Because Israel rejected Him, now the Gentiles would hear of God’s gift of grace. I heard a message on Sunday morning about how to understand unbelievers. One of the things the preacher stressed was that according to Romans 1: 19-25, all people know at some level that there is indeed a god, some greater being that is worthy of worship. That is why men have, down through the ages, fashioned all sorts of idols. They are satisfying a need to worship One greater than themselves. Jesus is The One. The only One. They look impressive, don’t they? Rich, ostentatious clothing; snowy beards and fancy prayer shawls. On the outside, they were the picture of piety. On the inside, they were full of themselves. They were malicious in their hatred of Jesus, Who had done them no harm. So what was their problem? Simply put, they couldn’t respond to Him when He asked them simple questions. And when they questioned Him, He always had a simple–and undebatable–response. He challenged their authority just by His existence. They couldn’t stand it, and they began to conspire to destroy Him. When Jesus knew what the Pharisees were up to, and I think He knew it pretty quickly, we are told that He withdrew Himself. It wasn’t time yet for Him to go to the cross. He still had much to do, much to teach and preach, before that time came. The multitudes continued to follow Him, and we are told He healed them all. No wonder there were times when He was weary, and needed to rest. Ministering to others is not a simple thing, and it drains one’s energy and emotions. There is a need for restoration. If Jesus needed to rest, then so do we. This short verse describing yet another miracle of healing sets the stage for the first time a council was called to determine what to do with Jesus. While He was in the process of still showing His Messianic powers, the religious leaders were whispering among themselves about how to get rid of Him. But that’s for tomorrow. Right now, I want to concentrate on this man with the withered hand. I found lots of pictures depicting this story. Some were dramatic, others just simple–there are even coloring pages available for children. I don’t think, though, that it was a simple thing for the afflicted man. I think it was a thing of great wonder and rejoicing for him, although we’re not told a lot about him here. Can you imagine looking into the face of God, seeing His eyes full of compassion and His face radiating kindness? Can you imagine the awe and reverence the man must have felt in this very intimate meeting with Jesus? Jesus knew every bone, joint, muscle and sinew of the hand He was about to heal. He created it; He designed it, and He could have healed it with no more than a glance. We are told that He made it clear that the healing power was His. 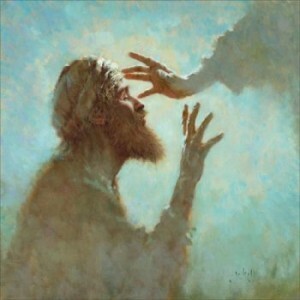 He instructed the man to stretch out his hand so that all who were present would see the miracle take place. Can you imagine this moment: The man stretched out his arm, and the withered hand was whole and strong, just like the other one. Imagine the voices of the people, quiet in their awe of the miracle. 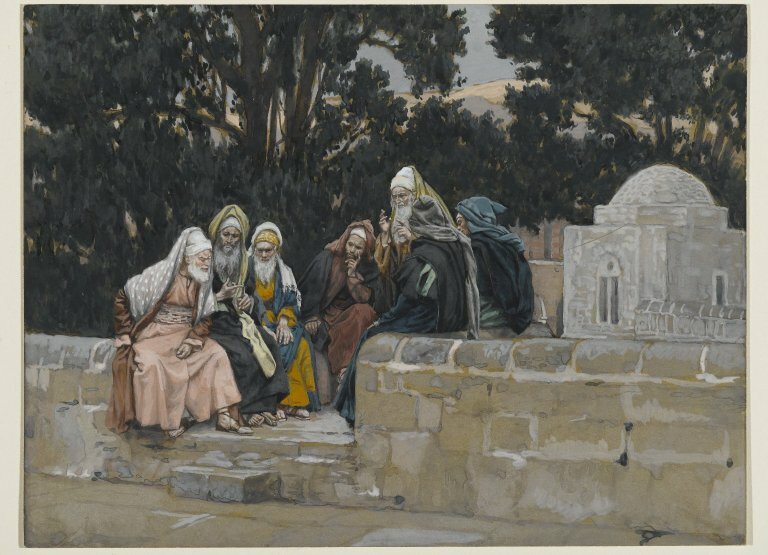 Imagine the glances exchanged among the Pharisees who witnessed the healing and could find nothing at all to say. That’s why they went aside to whisper among themselves. How do you refute a miracle you just saw with your own eyes? Of course, the whole incident made me think of a song I’ve posted before. As far as we know, Jesus did not touch this man; however, He touched many others. He has touched me, and every other person who has trusted Him for salvation. We are restored and made whole. He Touched Me. I love the way Jesus used simple, familiar illustrations to drive a point home quickly and clearly. “Is it lawful to heal on the sabbath days?” asked the Pharisees. “Which of you, if you had one sheep and it fell into the ditch, would not lift it out on the Sabbath?” answered Jesus. Complete silence. Of course they would all rescue an endangered animal. Their livelihood depended upon keeping their flocks in good health. Not one of them would turn aside from saving that sheep. So–they had nothing to say. His point, stated in the following verse, was that it is never wrong to do good on the Sabbath. That’s God-logic. That’s a perfect picture of “My ways are higher than your ways, My thoughts than your thoughts” (Isaiah 55:8-9). Silly Pharisees, thinking they could outfox the Lord. He was always ready for them, and knew their motives before they ever opened their mouths. He knows us that well, too. Is It Lawful. . . .? At this point, one might imagine that Jesus would wash His hands of the Jews and walk away. Jesus, however, is always good; always patient; always loving. He did not abruptly turn from His people. Rather, He continued to give them opportunities to see the truth. In this passage, Jesus entered a synagogue. Typically, He would teach and preach there. This time, however, there was a man with a “withered” hand. Always curious, I wanted to know exactly what withered means in this verse. Exactly what it says: dried up, shriveled, dessicated. We don’t know if he was born that way, or had an accident of some kind. In any event, the hand was useless to him. This must have been a different group than the ones at the wheat field. Either that, or they were slow learners. Jesus gave them, again, an answer they couldn’t refute. It must have driven them crazy.